Daylight job: I do some voluntary work for Help Musicians UK (previously called The Musician’s Benevolent Fund). I visit retired and disabled musicians socially and I can make recommendations if they need any social or financial help to the charity. I enjoy it. It’s such a worthwhile thing to do and I get to meet professional musicians who have spent their whole life making music. Why did you join a choir? I do enjoy singing, sometimes, but probably most of the time I can’t say I have a love of singing. This might seem unusual for someone who sings in a choir and often does solo singing in church not to have a particularly strong passion, or pleasure, for singing. I joined the choir because I find that it helps my understanding of the music. I like being introduced to music and learning it and being moved by it, if it stirs one’s emotions. If one sings a piece of music, over and over again then this process gives me a greater appreciation, and love, for the music in question. By singing, one can also concentrate of the text and if in opera, there’s the acting, costumes, lights and production. The experiences I gain in a choir can be transferred into watching other people singing. What do you enjoy most about singing with us? There is the social aspect of it as there is a tea break during rehearsals (something that some choirs do not have). A friendly face and a chat is a nice way to spend one’s time. During concerts I seen there are some audience members who just ‘glow’ and smile so broadly when they hear us singing a piece of music which they appear to know. There is satisfaction bringing joy into someone’s face! What is the most exciting piece you’ve ever sung? Within the choir, I enjoyed doing Charpentier’s Te Deum. French baroque music, which I enjoy, isn’t often performed in Scotland. Outwith the choir, singing for the Pope at the Papal mass (and having a couple of close ups of the recorded event of me on tv). What’s the hardest piece you’ve ever sung? I wouldn’t say I feel that confident about doing ‘runs’, so some music that has these long, long runs is quite hard, especially in some of Handel and Mozart’s music. Do you also play an instrument and if so, which? Piano, but not very well. What other music do you enjoy? Lieder, Bel Canto Operas, ‘soprano’ based music. Handel and Mozart. Baroque, French and Italian. Ella Fitzgerald, Whitney Houston, Diana Ross and some Tina Turner (i.e. Quality pop). What do you enjoy doing when you’re not singing? If I’m not singing, then I enjoy hearing other people sing. I am always going to concerts and operas. 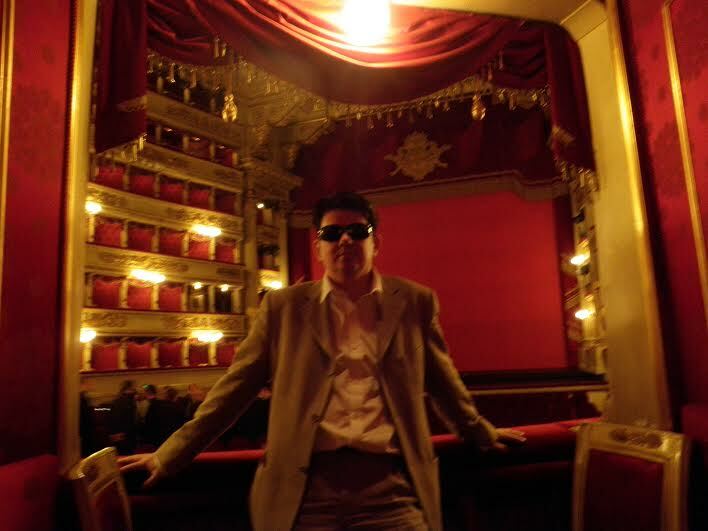 I like visiting world class opera houses and art galleries. I also enjoy reading plays, audio books, radio dramas. What’s your choir super-power? Every choir has its ‘key’ singers. If someone has been accepted to sing with the choir, then I would treat everyone equally, and with respect, no matter if I thought they were a strong or weak singer. What would you say to anyone thinking of joining our choir? Give it a go. You have nothing to lose. We are a friendly bunch and the choir must be doing something right if I’ve had a connection with it, since my school days, and I’m still there over 30 years later. If you’d like to join Michael and have a (potentially in-depth) chat about La Scala (see photo), do come along for one of our rehearsals!